The Orly Hope and Freedom Fest Collection for spring 2013 came out awhile ago online and I’m a bit late to the party for this one! The collection consists of six new shades in various finishes. The three not shown are Boho Bonnet (light blue creme), Melodious Utopia (pale shimmery yellow) and Coachella Dweller (lime green creme). Elation Generation is a warm pink with micro-holographic glitter. 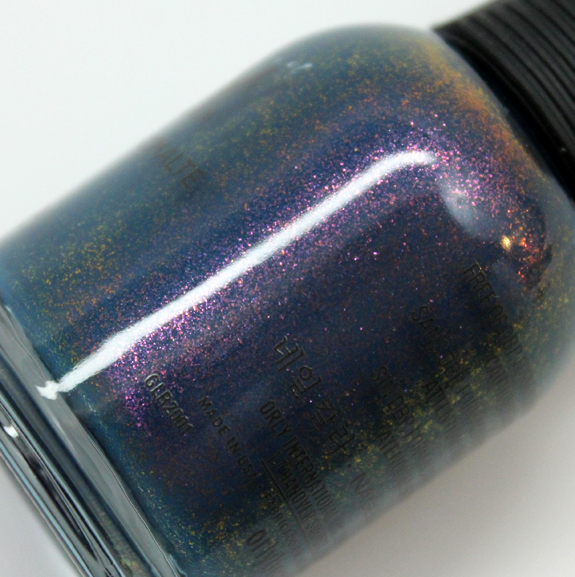 Nice shade and the holo glitter disperses evenly and easily on the nail. You get really good coverage with just two coats. Peaceful Opposition has a milky white base and square and hex silver glitter chunks. I dig the square glitter because you don’t see it that often. I thought this would be a pain to apply because the glitter is chunkier, but it’s not bad. With two coats my nails were pretty well covered with the base color and glitter. High On Hope is a blurple with duochrome shimmer. Oh man this shade is intense and changes constantly with the light. The shimmer is mainly pink, blue and purple but you see hints of gold and maybe a wee bit of green in there when you move your hand around. It’s SO much better in person than this photo. Great creamy smooth formula, just two coats. This became a favorite shade as soon as I swatched it. Overall: I really liked the three I swatched here. I think the most unique are Peaceful Opposition and High On Hope. All covered really nicely with two coats and the glitters are easy to work with. High On Hope is stunning, it’s a must have! Availability: Online, in stores now. See anything here you love?